Taylor C. Noakes has written for Maisonneuve and Monocle. Photograph by Taylor C. Noakes The Pavillon Mordecai-Richler photographed in June 2015. 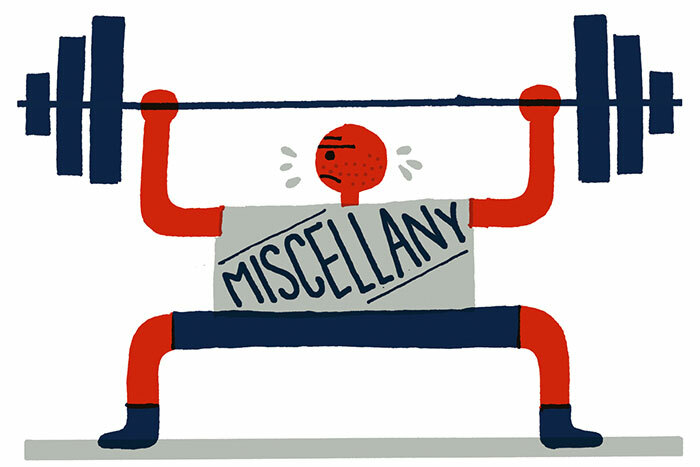 In architecture, a folly is a structure built as a decoration, though giving the impression of having a functional purpose. Montreal’s most recent example started out as a comparatively modest and politically inoffensive project to renovate a dilapidated bandstand and baptize it in tribute to one of Canada’s most influential authors. The Pavillon Mordecai-Richler opened in the first week of September, ending a five-year-long saga that cost more than $750,000, and left even Mordecai Richler’s most enthusiastic supporters scratching their heads: How could such a simple project take so long and cost so much? It took a decade after Richler’s passing in 2001 for the city of his birth to propose any kind of lasting tribute, and only after a councillor collected more than 4,000 signatures in a petition. Initially it was thought re-naming a street or a park in Richler’s old neighbourhood would be fitting, though this was kiboshed by the Plateau Mont-Royal borough government on the grounds that this kind of gesture wouldn’t jibe well with the local cultural heritage of the Mile End, even though the neighbourhood is populated largely by artists, musicians and others involved in cultural and creative pursuits. By contrast, American-born singer and Juno winner Lhasa de Sela, who died in 2010 at the age of thirty-seven, had a park in the same borough named after her four years later. When the borough rejected the plan to make a similar tribute for Richler, former mayor Gérald Tremblay proposed re-naming a disused bandstand on the eastern flank of Mount Royal instead. It was a safe but overtly political move: though Mount Royal Park is immediately adjacent to the Plateau, it is administratively part of Ville-Marie borough and thus falls under the direct jurisdiction of the mayor. The plan was announced in 2011 to little controversy, as the bandstand was both unnamed and largely without purpose. It was an odd choice given Richler had never mentioned the bandstand in his writing, and though he would have been aware of its existence, the city’s claim that Richler had grown up nearby was a bit of a stretch as he was actually raised several kilometers farther north. The plan to name a building—even a purposeless one—after Richler was considered a strong option, because renaming streets and parks tended to solicit greater resistance. The Tremblay administration’s attempt to rename Montreal’s iconic Parc Avenue after former premier Robert Bourassa in 2006 was met with near universal disapproval. The Richler family made it clear they weren’t interested in going down the same road, and perhaps this was for the best, given Richler’s old drinking buddy, the boulevardier, columnist, and former city councillor Nick Auf der Maur was honoured with a urine-stained alleyway running between some of the city’s less reputable nightspots. Despite an ostensibly inoffensive plan in hand and the family’s reluctant blessing, nothing happened to the bandstand for four years, outside of removing its rotted floorboards and erecting security fencing to keep out the venue’s only actual users—the homeless. The project fell off the municipal radar until April 2014 when newly minted mayor Denis Coderre decided Montreal had gone far too long dragging its feet on paying tribute to Richler. Coderre wanted to distinguish himself from his scandal-plagued predecessors as a more hands-on, take-charge type of mayor, and so a contract was awarded, without competition, to the architectural firm Beaupré-Michaud to conduct a study of the site and structure, and to propose a design and a purpose for the old bandstand. What they came up with was an elegant renovation of the original structure, along with some better lighting and park furniture to make the pavilion a kind of venue for live poetry readings or small musical performances. The study cost $57,000; the plan to restore the bandstand was estimated at $370,000. Coderre insisted that despite the high price tag the new pavilion would properly honour Richler. For yet another year, little happened. In the spring of 2015 Coderre announced, with the support of the Richler family and the Plateau Mont-Royal borough administration, that the Mile End library would be re-christened in Richler’s name. At long last a fitting tribute, not merely for the obvious reason, but also because the building would be named for an English author in the French part of town occupying what was once an Anglican church in a primarily Hassidic neighbourhood. Though some had assumed this effort would replace the “Richler Gazebo” project, as it was colloquially known, Coderre insisted that pavilion would be completed come hell or high water, even indicating he’d do the job himself if necessary, and that the project would be completed by the fall at the latest. By November the cost estimate had grown to $593,000. Locals began wondering aloud whether any of this made sense. Coderre had already managed to get a library named after Richler, and the cost estimate to renovate the derelict bandstand had almost doubled in a year. A local contractor offered his largest and most luxurious gazebo (a cost of $25,000 and about twice as large as the original structure) to the city pro bono, though this offer was refused outright. Coderre’s story changed from properly honouring Montreal’s most accomplished author to preserving the architectural heritage of the city and of Mount Royal. Cost overruns were explained away with the discovery of lead paint (requiring a work stoppage and decontamination) to unanticipated complications related to how the structure was secured to the ground (it wasn’t) to unforeseen rusting. And so it went, until September, when the pavilion opened to little fanfare and no opening ceremony. Shortly after the protective fencing was taken down the building was defaced with graffiti, to which Coderre announced police patrols in the area would be stepped up. The final bill is now somewhere north of $750,000, about as much as you might spend on a tony duplex in Montreal’s perennially chic Plateau Mont-Royal borough. The pavilion features nowhere to sit and no lighting. 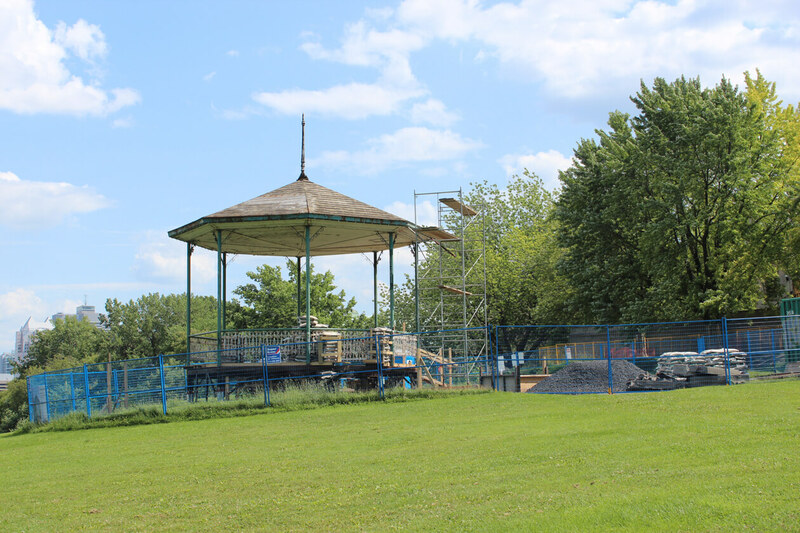 Questioned about the sky-high final cost, Coderre remarked, as if dared to repeat the effort, that other identical bandstands located elsewhere in town and in need of renovation are estimated to cost about as much. In mid-September, city officials unveiled the most recent tribute to Richler, an elegant mural bearing his likeness—bringing the total number of public (and publicly-funded) monuments and tributes to Richler to three, not including either McGill University’s writer-in-residence program or the Richler library collection at Concordia University. Perhaps most significantly (at least according to his wife, Florence Richler), a major French language book publisher, Les Editions du Boréal, has committed to translating several of Richler’s greatest hits so as to render the author’s work more accessible to Francophones.